"Saxon" redirects here. For other uses, see Saxon (disambiguation). The Saxons (Latin: Saxones, German: Sachsen, Old English: Seaxe, Old Saxon: Sahson, Low German: Sassen, Dutch: Saksen) were a Germanic people whose name was given in the early Middle Ages to a large country (Old Saxony, Latin: Saxonia) near the North Sea coast of what is now Germany. Earlier, in the late Roman Empire, the name was used to refer to Germanic inhabitants of what is now England, and also as a word something like the later "Viking", as a term for raiders. In Merovingian times, continental Saxons were associated with the coast of what later became Normandy. Though sometimes described as also fighting inland, coming in conflict with the Franks and Thuringians, no clear homeland can be defined. There is possibly a single classical reference to a smaller homeland of an early Saxon tribe, but it is disputed. According to this proposal, the Saxons' earliest area of settlement is believed to have been Northern Albingia. This general area is close to the probable homeland of the Angles. 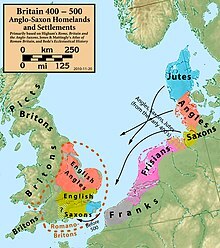 In contrast, the British "Saxons", today referred to in English as Anglo-Saxons, became a single nation bringing together Germanic peoples (Frisian, Jutish, Angle) with the Romanized populations, establishing long-lasting post-Roman kingdoms equivalent to those formed by the Franks on the continent. Their earliest weapons and clothing south of the Thames were based on late Roman military fashions, but later immigrants north of the Thames showed a stronger North German influence. The term "Anglo-Saxon" came into use by the 8th century (for example Paul the Deacon) to distinguish English Saxons from continental Saxons (referred to in the Anglo-Saxon Chronicle as Ealdseaxe, "old Saxons"), but the Saxons of Britain and those of Old Saxony (Northern Germany) continued to be referred to as 'Saxons' in an indiscriminate manner, especially in the languages of Britain and Ireland. However, while the English Saxons were no longer raiders, the political history of the continental Saxons is unclear until the time of the conflict between their semi-legendary hero Widukind and the Frankish emperor Charlemagne. While the continental Saxons are no longer a distinctive ethnic group or country, their name lives on in the names of several regions and states of Germany, including Lower Saxony (which includes the original Saxon homeland known as Old Saxony), as well as the two states that make up Upper Saxony, known today as Saxony-Anhalt and Saxony. The latter have their names from dynastic history, and not their ethnic history. The Saxons may have derived their name from seax, a kind of knife for which they were known. The seax has a lasting symbolic impact in the English counties of Essex and Middlesex, both of which feature three seaxes in their ceremonial emblem. Their names, along with those of Sussex and Wessex, contain a remnant of the word "Saxon". Their names discover what their natures are, More hard than stones, and yet not stones indeed. In the Celtic languages, the words designating English nationality derive from the Latin word Saxones. The most prominent example, a loanword in English, is the Scottish word Sassenach, used by Scots- or Scottish English-speakers in the 21st century as a jocular term for an English person. The Oxford English Dictionary (OED) gives 1771 as the date of the earliest written use of the word in English. It derives from the Scottish Gaelic Sasannach (older spelling: Sasunnach). The Gaelic name for England is Sasann, and Sasannach (formed with a common adjective suffix -ach) means "English" in reference to people and things, though not to the English Language, which is Beurla. Sasanach, the Irish word for an Englishman, has the same derivation, as do the words used in Welsh to describe the English people (Saeson, sing. Sais) and the language and things English in general: Saesneg and Seisnig. Cornish terms the English Sawsnek, from the same derivation. In the 16th century Cornish-speakers used the phrase Meea navidna cowza sawzneck to feign ignorance of the English language. "England" in Scottish Gaelic is Sasann (older spelling: Sasunn, Genitive: Sasainn). Other examples include the Welsh Saesneg (the English language), Irish Sasana (England), Breton saoz(on) (English, saozneg "the English language", Bro-saoz "England"), and Cornish Sowson (English people), Sowsnek (English language), and Pow Sows for 'Land [Pays] of Saxons'. The label "Saxons" (in Romanian: Sași) also became attached to German settlers who migrated during the 13th century to southeastern Transylvania. From Transylvania, some of these Saxons migrated to neighbouring Moldavia, as the name of the town Sas-cut shows. Sascut lies in the part of Moldavia that is today part of Romania. During Georg Friederich Händel's visit to Italy (1706–09), much was made[by whom?] of his origins in Saxony; in particular, the Venetians greeted the 1709 performance of his opera Agrippina with the cry Viva il caro Sassone, "Cheers for the beloved Saxon!" The word also survives as the surnames of Saß/Sass (in Low German or Low Saxon), Sachse and Sachs. The Dutch female first name, Saskia, originally meant "A Saxon woman" (metathesis of "Saxia"). Following the downfall of Henry the Lion (1129–1195, Duke of Saxony 1142–1180), and the subsequent splitting of the Saxon tribal duchy into several territories, the name of the Saxon duchy was transferred to the lands of the Ascanian family. This led to the differentiation between Lower Saxony, lands settled by the Saxon tribe and Upper Saxony, the lands belonging to the House of Wettin. Gradually, the latter region became known as "Saxony", ultimately usurping the name's original meaning. The area formerly known as Upper Saxony now lies in Central Germany. 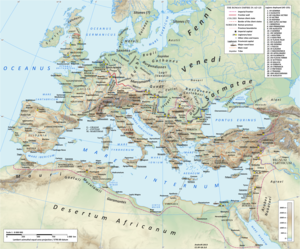 Europe in the late 5th century. 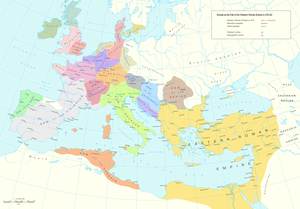 Most names shown are the Latin names of 5th-century peoples, with the exceptions of Syagrius (king of a Gallo-Roman rump state), Odoacer (Germanic king of Italy), and (Julius) Nepos (nominally the last Western Roman emperor, de facto ruler of Dalmatia). Possible locations of the Angles, Saxons and Jutes before their migration to Britain. Ptolemy's Geographia, written in the 2nd century, is sometimes considered to contain the first mentioning of the Saxons. Some copies of this text mention a tribe called Saxones in the area to the north of the lower Elbe. However, other versions refer to the same tribe as Axones. This may be a misspelling of the tribe that Tacitus in his Germania called Aviones. According to this theory, "Saxones" was the result of later scribes trying to correct a name that meant nothing to them. On the other hand, Schütte, in his analysis of such problems in Ptolemy's Maps of Northern Europe, believed that "Saxones" is correct. He notes that the loss of first letters occurs in numerous places in various copies of Ptolemy's work, and also that the manuscripts without "Saxones" are generally inferior overall. Schütte also remarks that there was a medieval tradition of calling this area "Old Saxony" (covering Westphalia, Angria and Eastphalia). This view is in line with Bede who mentions Old Saxony was near the Rhine, somewhere to the north of the river Lippe (Westphalia, northeastern part of modern German state Nordrhein-Westfalen). The first undisputed mention of the Saxon name in its modern form is from AD 356, when Julian, later the Roman Emperor, mentioned them in a speech as allies of Magnentius, a rival emperor in Gaul. Zosimus also mentions a specific tribe of Saxons, called the Kouadoi, which have been interpreted as a misunderstanding for the Chauci, or Chamavi. They entered the Rhineland and displaced the recently settled Salian Franks from Batavi, whereupon some of the Salians began to move into the Belgian territory of Toxandria, supported by Julian. Both in this case and in others the Saxons were associated with using boats for their raids. In order to defend against Saxon raiders, the Romans created a military district called the Litus Saxonicum ("Saxon Coast") on both sides of the English Channel. In 441–442 AD, Saxons are mentioned for the first time as inhabitants of Britain, when an unknown Gaulish historian wrote: "The British provinces...have been reduced to Saxon rule". Saxons as inhabitants of present-day Northern Germany are first mentioned in 555, when the Frankish king Theudebald died, and the Saxons used the opportunity for an uprising. The uprising was suppressed by Chlothar I, Theudebald's successor. Some of their Frankish successors fought against the Saxons, others were allied with them. The Thuringians frequently appeared as allies of the Saxons. In the Netherlands, Saxons occupied the territory south of the Frisians and north of the Franks. In the west it reached as far as the Gooi region, in the south as far as the Lower Rhine. After the conquest of Charlemagne, this area formed the main part of the Bishopric of Utrecht. The Saxon duchy of Hamaland played an important role in the formation of the duchy of Guelders. The local language, although strongly influenced by standard Dutch, is still officially recognised as Dutch Low Saxon. In 569, some Saxons accompanied the Lombards into Italy under the leadership of Alboin and settled there. In 572, they raided southeastern Gaul as far as Stablo, now Estoublon. Divided, they were easily defeated by the Gallo-Roman general Mummolus. When the Saxons regrouped, a peace treaty was negotiated whereby the Italian Saxons were allowed to settle with their families in Austrasia. Gathering their families and belongings in Italy, they returned to Provence in two groups in 573. One group proceeded by way of Nice and another via Embrun, joining up at Avignon. They plundered the territory and were as a consequence stopped from crossing the Rhône by Mummolus. They were forced to pay compensation for what they had robbed before they could enter Austrasia. These people are known only by documents, and their settlement cannot be compared to the archeological artifacts and remains that attest to Saxon settlements in northern and western Gaul. A Saxon king named Eadwacer conquered Angers in 463 only to be dislodged by Childeric I and the Salian Franks, allies of the Roman Empire. It is possible that Saxon settlement of Great Britain began only in response to expanding Frankish control of the Channel coast. Some Saxons already lived along the Saxon shore of Gaul as Roman foederati. They can be traced in documents, but also in archeology and in toponymy. The Notitia Dignitatum mentions the Tribunus cohortis primae novae Armoricanae, Grannona in litore Saxonico. The location of Grannona is uncertain and was identified by the historians and toponymists at different places: mainly with the town known today as Granville (in Normandy) or nearby. The Notitia Dignitatum does not explain where these "Roman" soldiers came from. Some toponymists have proposed Graignes (Grania 1109–1113) as the location for Grannona/Grannonum. Although some scholars believe it could be the same element *gran, that is recognised in Guernsey (Greneroi 11th century), it most likely derives from the Gaulish god Grannos. This location is closer to Bayeux, where Gregory of Tours evokes otherwise the Saxones Bajocassini (Bessin Saxons), which were ineffective against the Breton Waroch II in 579. A Saxon unit of laeti settled at Bayeux – the Saxones Baiocassenses. These Saxons became subjects of Clovis I late in the 5th century. The Saxons of Bayeux comprised a standing army and were often called upon to serve alongside the local levy of their region in Merovingian military campaigns. In 589, the Saxons wore their hair in the Breton fashion at the orders of Fredegund and fought with them as allies against Guntram. Beginning in 626, the Saxons of the Bessin were used by Dagobert I for his campaigns against the Basques. One of their own, Aeghyna, was created a dux over the region of Vasconia. In 843 and 846 under king Charles the Bald, other official documents mention a pagus called Otlinga Saxonia in the Bessin region, but the meaning of Otlinga is unclear. Different Bessin toponyms were identified as typically Saxon, ex : Cottun (Coltun 1035–1037 ; Cola's "town"). It is the only place name in Normandy that can be interpreted as a -tun one (English -ton; cf. Colton). In contrast to this one example in Normandy are numerous -thun villages in the north of France, in Boulonnais, for example Alincthun, Verlincthun, and Pelingthun, showing, with other toponyms, an important Saxon or Anglo-Saxon settlement. Comparing the concentration of -ham/-hem (Anglo-Saxon hām > home) toponyms in the Bessin and in the Boulonnais gives more examples of Saxon settlement. In the area known today as Normandy, the -ham cases of Bessin are unique – they do not exist elsewhere. Other cases were considered, but there is no determining example. For example, Canehan (Kenehan 1030/Canaan 1030–1035) could be the biblical name Canaan or Airan (Heidram 9th century), the Germanic masculine name Hairammus. The Bessin examples are clear; for example, Ouistreham (Oistreham 1086), Étréham (Oesterham 1350 ? ), Huppain (*Hubbehain ; Hubba's "home"), and Surrain (Surrehain 11th century). Another significant example can be found in the Norman onomastics: the widespread surname Lecesne, with variant spellings: Le Cesne, Lesène, Lecène, and Cesne. It comes from Gallo-Romance *SAXINU "the Saxon", which is saisne in Old French. These examples are not derived from more recent Anglo-Scandinavian toponyms, because in that case they would have been numerous in the Norman regions (pays de Caux, Basse-Seine, North-Cotentin) settled by Germanic peoples. [clarification needed] That is not the case, nor does Bessin belong to the pagii, which were affected by an important wave of Anglo-Scandinavian immigration. In addition, archaeological finds add evidence to the documents and the results of toponymic research. Around the city of Caen and in the Bessin (Vierville-sur-Mer, Bénouville, Giverville, Hérouvillette), excavations have yielded numerous examples of Anglo-Saxon jewellery, design elements, settings, and weapons. All of these things were discovered in cemeteries in a context of the 5th, 6th and 7th centuries AD. The oldest and most spectacular Saxon site found in France to date is Vron, in Picardy. There, archaeologists excavated a large cemetery with tombs dating from the Roman Empire until the 6th century. Furniture and other grave goods, as well as the human remains, revealed a group of people buried in the 4th and 5th centuries AD. Physically different from the usual local inhabitants found before this period, they instead resembled the Germanic populations of the north. At the beginning (4th century), 92% were buried, sometimes with typical Germanic weapons. Then they were ranked to the east[clarification needed], when they were buried in the 5th and later to the beginning of the 6th century. [clarification needed] A strong Anglo-Saxon influence became obvious for the middle of the period, but this influence later disappeared. Archaeological material, neighbouring toponymy, and texts[clarification needed] support the same conclusion: settlement of Saxon foederati with their families. Further anthropological research by Joël Blondiaux shows these people were from Low Saxony. Saxons, along with Angles, Frisians and Jutes, invaded or migrated to the island of Great Britain (Britannia) around the time of the collapse of the Western Roman Empire. Saxon raiders had been harassing the eastern and southern shores of Britannia for centuries before, prompting the construction of a string of coastal forts called the Litora Saxonica or Saxon Shore. Before the end of Roman rule in Britannia, many Saxons and other folk had been permitted to settle in these areas as farmers. According to tradition, the Saxons (and other tribes) first entered Britain en masse as part of an agreement to protect the Britons from the incursions of the Picts, Gaels and others. 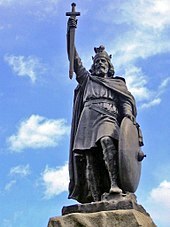 The story, as reported in such sources as the Historia Brittonum and Gildas, indicates that the British king Vortigern allowed the Germanic warlords, later named as Hengist and Horsa by Bede, to settle their people on the Isle of Thanet in exchange for their service as mercenaries. According to Bede, Hengist manipulated Vortigern into granting more land and allowing for more settlers to come in, paving the way for the Germanic settlement of Britain. For the fire...spread from sea to sea, fed by the hands of our foes in the east, and did not cease, until, destroying the neighbouring towns and lands, it reached the other side of the island, and dipped its red and savage tongue in the western ocean. In these assaults...all the columns were levelled with the ground by the frequent strokes of the battering-ram, all the husbandmen routed, together with their bishops, priests and people, whilst the sword gleamed, and the flames crackled around them on every side. Lamentable to behold, in the midst of the streets lay the tops of lofty towers, tumbled to the ground, stones of high walls, holy altars, fragments of human bodies, covered with livid clots of coagulated blood, looking as if they had been squeezed together in a press; and with no chance of being buried, save in the ruins of the houses, or in the ravening bellies of wild beasts and birds; with reverence be it spoken for their blessed souls, if, indeed, there were many found who were carried, at that time, into the high heaven by the holy angels... Some, therefore, of the miserable remnant, being taken in the mountains, were murdered in great numbers; others, constrained by famine, came and yielded themselves to be slaves for ever to their foes, running the risk of being instantly slain, which truly was the greatest favour that could be offered them: some others passed beyond the seas with loud lamentations instead of the voice of exhortation...Others, committing the safeguard of their lives, which were in continual jeopardy, to the mountains, precipices, thickly wooded forests and to the rocks of the seas (albeit with trembling hearts), remained still in their country. Gildas described how the Saxons were later slaughtered at the battle of Mons Badonicus 44 years before he wrote his history, and their conquest of Britain halted. The 8th-century English historian Bede tells how their advance resumed thereafter. He said this resulted in a swift overrunning of the entirety of South-Eastern Britain, and the foundation of the Anglo-Saxon kingdoms. East Saxons: created the Kingdom of Essex. During the period of the reigns from Egbert to Alfred the Great, the kings of Wessex emerged as Bretwalda, unifying the country. They eventually organised it as the kingdom of England in the face of Viking invasions. The Continental Saxons living in what was known as Old Saxony (c. 531-804) appear to have become consolidated by the end of the 8th century. After subjugation by the Emperor Charlemagne, a political entity called the Duchy of Saxony (804-1296) appeared, covering Westphalia, Eastphalia, Angria and Nordalbingia (Holstein, southern part of modern-day Schleswig-Holstein state). Under Carolingian rule, the Saxons were reduced to tributary status. There is evidence that the Saxons, as well as Slavic tributaries such as the Abodrites and the Wends, often provided troops to their Carolingian overlords. The dukes of Saxony became kings (Henry I, the Fowler, 919) and later the first emperors (Henry's son, Otto I, the Great) of Germany during the 10th century, but they lost this position in 1024. The duchy was divided in 1180 when Duke Henry the Lion refused to follow his cousin, Emperor Frederick Barbarossa, into war in Lombardy. During the High Middle Ages, under the Salian emperors and, later, under the Teutonic Knights, German settlers moved east of the Saale into the area of a western Slavic tribe, the Sorbs. The Sorbs were gradually Germanised. This region subsequently acquired the name Saxony through political circumstances, though it was initially called the March of Meissen. The rulers of Meissen acquired control of the Duchy of Saxony (only a remnant of the previous Duchy) in 1423; they eventually applied the name Saxony to the whole of their kingdom. Since then, this part of eastern Germany has been referred to as Saxony (German: Sachsen), a source of some misunderstanding about the original homeland of the Saxons, with a central part in the present-day German state of Lower Saxony (German: Niedersachsen). Bede, a Northumbrian writing around the year 730, remarks that "the old (that is, the continental) Saxons have no king, but they are governed by several ealdormen (or satrapa) who, during war, cast lots for leadership but who, in time of peace, are equal in power." The regnum Saxonum was divided into three provinces – Westphalia, Eastphalia and Angria – which comprised about one hundred pagi or Gaue. Each Gau had its own satrap with enough military power to level whole villages that opposed him. In the mid-9th century, Nithard first described the social structure of the Saxons beneath their leaders. The caste structure was rigid; in the Saxon language the three castes, excluding slaves, were called the edhilingui (related to the term aetheling), frilingi and lazzi. These terms were subsequently Latinised as nobiles or nobiliores; ingenui, ingenuiles or liberi; and liberti, liti or serviles. According to very early traditions that are presumed to contain a good deal of historical truth, the edhilingui were the descendants of the Saxons who led the tribe out of Holstein and during the migrations of the 6th century. They were a conquering warrior elite. The frilingi represented the descendants of the amicii, auxiliarii and manumissi of that caste. The lazzi represented the descendants of the original inhabitants of the conquered territories, who were forced to make oaths of submission and pay tribute to the edhilingui. The Lex Saxonum regulated the Saxons' unusual society. Intermarriage between the castes was forbidden by the Lex, and wergilds were set based upon caste membership. The edhilingui were worth 1,440 solidi, or about 700 head of cattle, the highest wergild on the continent; the price of a bride was also very high. This was six times as much as that of the frilingi and eight times as much as the lazzi. The gulf between noble and ignoble was very large, but the difference between a freeman and an indentured labourer was small. According to the Vita Lebuini antiqua, an important source for early Saxon history, the Saxons held an annual council at Marklo (Westphalia) where they "confirmed their laws, gave judgment on outstanding cases, and determined by common counsel whether they would go to war or be in peace that year." All three castes participated in the general council; twelve representatives from each caste were sent from each Gau. In 782, Charlemagne abolished the system of Gaue and replaced it with the Grafschaftsverfassung, the system of counties typical of Francia. By prohibiting the Marklo councils, Charlemagne pushed the frilingi and lazzi out of political power. The old Saxon system of Abgabengrundherrschaft, lordship based on dues and taxes, was replaced by a form of feudalism based on service and labour, personal relationships and oaths. Saxon religious practices were closely related to their political practices. The annual councils of the entire tribe began with invocations of the gods. The procedure by which dukes were elected in wartime, by drawing lots, is presumed to have had religious significance, i.e. in giving trust to divine providence – it seems – to guide the random decision making. There were also sacred rituals and objects, such as the pillars called Irminsul; these were believed to connect heaven and earth, as with other examples of trees or ladders to heaven in numerous religions. Charlemagne had one such pillar chopped down in 772 close to the Eresburg stronghold. Early Saxon religious practices in Britain can be gleaned from place names and the Germanic calendar in use at that time. The Germanic gods Woden, Frigg, Tiw and Thunor, who are attested to in every Germanic tradition, were worshipped in Wessex, Sussex and Essex. They are the only ones directly attested to, though the names of the third and fourth months (March and April) of the Old English calendar bear the names Hrethmonath and Eosturmonath, meaning "month of Hretha" and "month of Ēostre." It is presumed that these are the names of two goddesses who were worshipped around that season. The Saxons offered cakes to their gods in February (Solmonath). There was a religious festival associated with the harvest, Halegmonath ("holy month" or "month of offerings", September). The Saxon calendar began on 25 December, and the months of December and January were called Yule (or Giuli). They contained a Modra niht or "night of the mothers", another religious festival of unknown content. The Saxon freemen and servile class remained faithful to their original beliefs long after their nominal conversion to Christianity. Nursing a hatred of the upper class, which, with Frankish assistance, had marginalised them from political power, the lower classes (the plebeium vulgus or cives) were a problem for Christian authorities as late as 836. The Translatio S. Liborii remarks on their obstinacy in pagan ritus et superstitio (usage and superstition). The conversion of the Saxons in England from their original Germanic religion to Christianity occurred in the early to late 7th century under the influence of the already converted Jutes of Kent. In the 630s, Birinus became the "apostle to the West Saxons" and converted Wessex, whose first Christian king was Cynegils. The West Saxons begin to emerge from obscurity only with their conversion to Christianity and keeping written records. The Gewisse, a West Saxon people, were especially resistant to Christianity; Birinus exercised more efforts against them and ultimately succeeded in conversion. In Wessex, a bishopric was founded at Dorchester. The South Saxons were first evangelised extensively under Anglian influence; Aethelwalh of Sussex was converted by Wulfhere, King of Mercia and allowed Wilfrid, Bishop of York, to evangelise his people beginning in 681. The chief South Saxon bishopric was that of Selsey. The East Saxons were more pagan than the southern or western Saxons; their territory had a superabundance of pagan sites. Their king, Saeberht, was converted early and a diocese was established at London. Its first bishop, Mellitus, was expelled by Saeberht's heirs. The conversion of the East Saxons was completed under Cedd in the 650s and 660s. The continental Saxons were evangelised largely by English missionaries in the late 7th and early 8th centuries. Around 695, two early English missionaries, Hewald the White and Hewald the Black, were martyred by the vicani, that is, villagers. Throughout the century that followed, villagers and other peasants proved to be the greatest opponents of Christianisation, while missionaries often received the support of the edhilingui and other noblemen. Saint Lebuin, an Englishman who between 745 and 770 preached to the Saxons, mainly in the eastern Netherlands, built a church and made many friends among the nobility. Some of them rallied to save him from an angry mob at the annual council at Marklo (near river Weser, Bremen). Social tensions arose between the Christianity-sympathetic noblemen and the pagan lower castes, who were staunchly faithful to their traditional religion. If the light yoke and sweet burden of Christ were to be preached to the most obstinate people of the Saxons with as much determination as the payment of tithes has been exacted, or as the force of the legal decree has been applied for fault of the most trifling sort imaginable, perhaps they would not be averse to their baptismal vows. 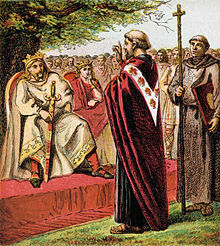 Charlemagne's successor, Louis the Pious, reportedly treated the Saxons more as Alcuin would have wished, and as a consequence they were faithful subjects. The lower classes, however, revolted against Frankish overlordship in favour of their old paganism as late as the 840s, when the Stellinga rose up against the Saxon leadership, who were allied with the Frankish emperor Lothair I. After the suppression of the Stellinga, in 851 Louis the German brought relics from Rome to Saxony to foster a devotion to the Roman Catholic Church. The Poeta Saxo, in his verse Annales of Charlemagne's reign (written between 888 and 891), laid an emphasis on his conquest of Saxony. He celebrated the Frankish monarch as on par with the Roman emperors and as the bringer of Christian salvation to people. References are made to periodic outbreaks of pagan worship, especially of Freya, among the Saxon peasantry as late as the 12th century. In the 9th century, the Saxon nobility became vigorous supporters of monasticism and formed a bulwark of Christianity against the existing Slavic paganism to the east and the Nordic paganism of the Vikings to the north. Much Christian literature was produced in the vernacular Old Saxon, the notable ones being a result of the literary output and wide influence of Saxon monasteries such as Fulda, Corvey and Verden; and the theological controversy between the Augustinian Gottschalk and Rabanus Maurus. From an early date, Charlemagne and Louis the Pious supported Christian vernacular works in order to evangelise the Saxons more efficiently. The Heliand, a verse epic of the life of Christ in a Germanic setting, and Genesis, another epic retelling of the events of the first book of the Bible, were commissioned in the early 9th century by Louis to disseminate scriptural knowledge to the masses. A council of Tours in 813 and then a synod of Mainz in 848 both declared that homilies ought to be preached in the vernacular. The earliest preserved text in the Saxon language is a baptismal vow from the late 8th or early 9th century; the vernacular was used extensively in an effort to Christianise the lowest castes of Saxon society. ^ (Springer 2004, p. 12): "Unter dem alten Sachsen ist das Gebiet zu verstehen, das seit der Zeit Karls des Großen (reg. 768-814) bis zum Jahre 1180 also Saxonia '(das Land) Sachsen' bezeichnet wurde oder wenigstens so genannt werden konnte." ^ (Springer 2004, p. 2004): "Im Latein des späten Altertums konnte Saxones als Sammelbezeichnung von Küstenräubern gebraucht werden. Es spielte dieselbe Rolle wie viele Jahrhunderte später das Wort Wikinger." ^ Haydn Middleton (1 June 2001). Romans, Anglo-Saxons & Vikings in Britain. Heinemann. pp. 7–. ISBN 978-0-431-10209-2. Retrieved 19 October 2012. ^ "Saxon | Definition of Saxon in English by Oxford Dictionaries". Oxford Dictionaries | English. Retrieved 10 March 2019. ^ "New times and old stories". Literary Appropriations of the Anglo-Saxons. p. 111 fn 14. ^ "Definition of SASSENACH". www.merriam-webster.com. Retrieved 16 January 2019. ^ Richard Carew, Survey of Cornwall, 1602. N.B. in revived Cornish, this would be transcribed, My ny vynnaf cows sowsnek. The Cornish word Emit meaning "ant" (and perversely derived from OE) is more commonly used in Cornwall as of 2015[update] as slang to designate non-Cornish Englishmen. ^ Suomen sanojen alkuperä. Etymologinen sanakirja, R-Ö. Suomalaisen kirjallisuuden seura, Kotimaisten kielten tutkimuskeskus. 2012. p. 146. ^ John T. Koch (2006). Celtic Culture: A Historical Encyclopedia. ABC-CLIO. pp. 59–. ISBN 978-1-85109-440-0. ^ Gregory of Tours, History of the Franks, Penguin 1974. ^ François de Beaurepaire, Les noms des communes et anciennes paroisses de la Manche, éditions Picard 1986. p. 125 –127. ^ Questions d'histoire de Bretagne (in French). E.N.S.B. 1984. p. 127. ISBN 9782735500468. ^ History of the Franks, volume II. Trans. O. M. Dalton, Clarendon Press 1967. ^ Fredegar, IV.54, p. 66. ^ Albert Dauzat and Charles Rostaing, Dictionnaire étymologique des noms de lieux en France, Librairie Guénégaud 1979. p. 215. ^ Louis Guinet, Les emprunts gallo-romans au germanique (du Ier à la fin du Vème siècle), éditions Klincksieck 1982. ^ François de Beaurepaire, Les noms des communes et anciennes paroisses de la Seine-Maritime, éditions Picard 1979. p. 56. ^ René Lepelley, Dictionnaire étymologique des noms de communes de Normandie, Charles Corlet / Presses universitaires de Caen. p. 46. ^ fr:Ernest Nègre, fr:Toponymie générale de la France, Volume II, Librairie Droz. p. 1008. ^ "Répartition des LECESNE entre 1891 et 1915" (in French). ^ Quelques témoignages de le présence Anglo-Saxonne dans le Calvados, Basse-Normandie (Christian Pilet), in Frühmittelalterliche Studien (1979), Berlin, New York (Walter de Gruyter) 2009. ^ Des Saxons en Basse-Normandie au VIe siècle ? A propos de quelques découvertes archéologiques faîtes récemment dans la basse vallée de l'Orne (C. Lorren) in Studien zur Sachsenforschung 2, 1980. ^ C. Seillier, La Présence germanique en Gaule du Nord au Bas-Empire, Revue du Nord, 1995, n° 77. ^ a b Benjamin Lieberman (22 March 2013). Remaking Identities: God, Nation, and Race in World History. Rowman & Littlefield Publishers. pp. 53–. ISBN 978-1-4422-1395-1. ^ a b Goldberg, 473. ^ a b Goldberg, 471. ^ a b Goldberg, 474. ^ a b Stenton, 97–98. ^ Hummer, 141, based on Astronomus. Bachrach, Bernard S. Merovingian Military Organisation, 481–751. Minneapolis: University of Minnesota Press, 1971. Goldberg, Eric J. "Popular Revolt, Dynastic Politics, and Aristocratic Factionalism in the Early Middle Ages: The Saxon Stellinga Reconsidered." Speculum, Vol. 70, No. 3. (Jul., 1995), pp 467–501. Hummer, Hans J. Politics and Power in Early Medieval Europe: Alsace and the Frankish Realm 600–1000. Cambridge University Press: 2005. Stenton, Sir Frank M. Anglo-Saxon England. 3rd ed. Oxford University Press, 1971. Wallace-Hadrill, J. M., translator. The Fourth Book of the Chronicle of Fredegar with its Continuations. Connecticut: Greenwood Press, 1960. Thompson, James Westfall. Feudal Germany. 2 vol. New York: Frederick Ungar Publishing Co., 1928. Chisholm, Hugh, ed. (1911). "Saxons" . Encyclopædia Britannica (11th ed.). Cambridge University Press.